I just finished watching my last sunset on the Ronald Brown and it is time that I reflect a little on this entire NOAA Teacher at Sea experience. The cruise gave me a first-hand look at some of the important work that atmospheric scientists and physical oceanographers examine. I discovered that the ocean system is huge and scientists around the world are compiling information about the ocean so we can better understand it. This work is like putting one of those big 1000 piece jigsaw puzzles together. The more pieces that you are able to put together, the better you understand how the pieces fit into the entire picture. Also because the system is so large, it takes the collaborative effort of many different scientists to really get some sort of understanding about what is happening. 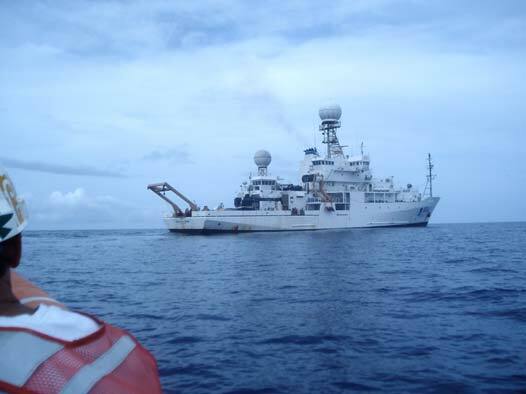 This cruise would never have been possible without the crew, the scientist and the NOAA Corp officers working as a team. There was science happening 24 hours and everyone did his or her part. I feel particularly lucky to be selected as the Teacher at Sea on this cruise and I would like to thank everyone that made it possible. The crew, the scientists, the NOAA Corp officers were friendly, helpful and always willing to explain things about the ships operation and the science that was happening on the ship. Thank you to the Teacher at Sea support staff that helped with logistics and information pertaining to the cruise. 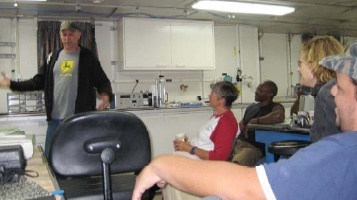 Special thanks go to than Dr. Rick Lumpkin, the chief scientist, for coordinating the cruise, explaining the science, and reviewing sea logs and Field Operations Officer, Nicole Manning for reviewing sea logs and coordinating things. Finally thank you to all the people that followed along with this adventure. It was always nice to see how many people were viewing the journal and photos. The questions were great and thanks for all the emails. The impacts that these experiences have on teachers and their students have implications that are far reaching. This has really been a special summer for me and thank you to everyone that made it possible. After being on the ship for 25 days, people were happy to have a day in San Juan, Puerto Rico as the ship refueled. We pulled into the Coast Guard station in Old San Juan around 9:00 am and then had the next 24 hours to explore. I got a chance to roam around town sample the local cuisine and visit a few historic spots. Visited the capital building, the Castillo San Cristobol, and San Fillipe de Morro Fort. We pulled out of the harbor at approximately 4:00pm on 8/7 and now are steaming to our final destination Key West. 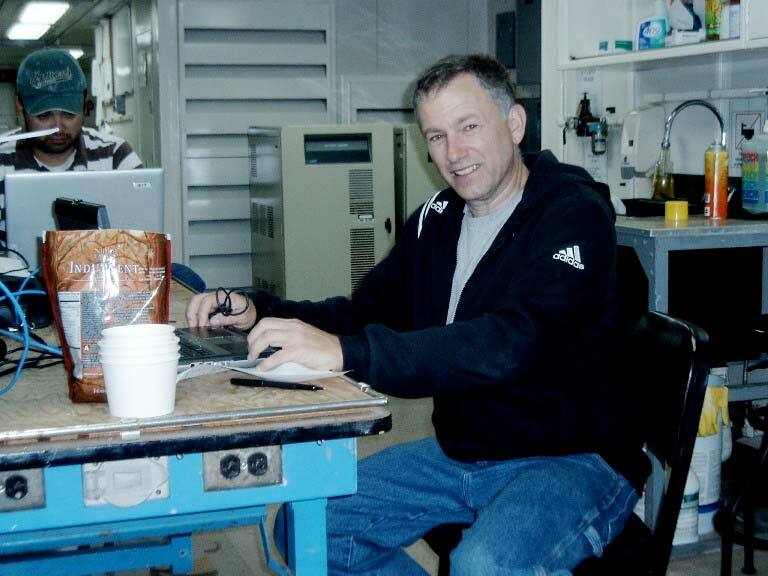 It is a bit quieter on the ship now since 9 of the scientists departed in Puerto Rico. The rest of the scientists are staying on to help unload their equipment in Key West. We deployed our last CTD and last buoy a few days ago. Two XBTs are deployed daily but that is nothing compared to the 10-12 we were doing a few weeks ago. 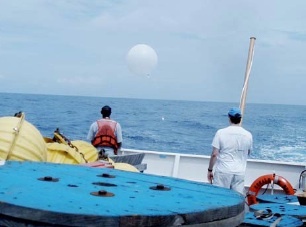 The atmospheric group is still sending up radiosondes and ozonesondes but it seems now that most of the scientists are wrapping up their work and trying to take a preliminary look at the data they collected. The analysis will really begin when they get back to their labs once we return to land. In the meantime, the work of packing things up has begun. We are now steaming directly toward San Juan, Puerto Rico. The crew has begun to stack all the equipment that will be eventually unloaded on the fantail of the ship. We will be arriving in Puerto Rico on the August 6th to refuel, and then we will be off to Key West on August 7th for the final leg of this cruise. It was my turn a few days ago to give the nightly science seminar. I talked about teacher-researcher collaboration, which included the NOAA Teacher at Sea Program and other programs I have participated in. 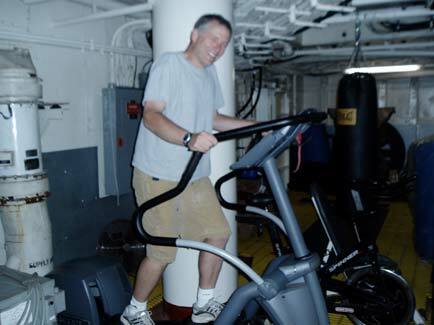 I have found it important to get some exercise everyday on the ship. I try to work out everyday in the ships fitness room. It has a rowing machine, treadmill, elliptical, bike and some free weights. You usually can find me there in the mornings before I get to work in the lab. 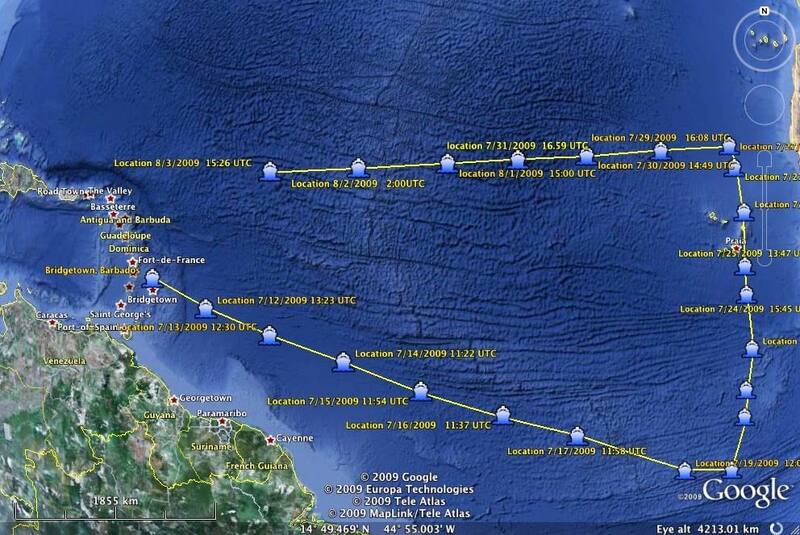 On the 28th of July we did our 34th CTD and changed out our third buoy and started to steam west back towards the states. 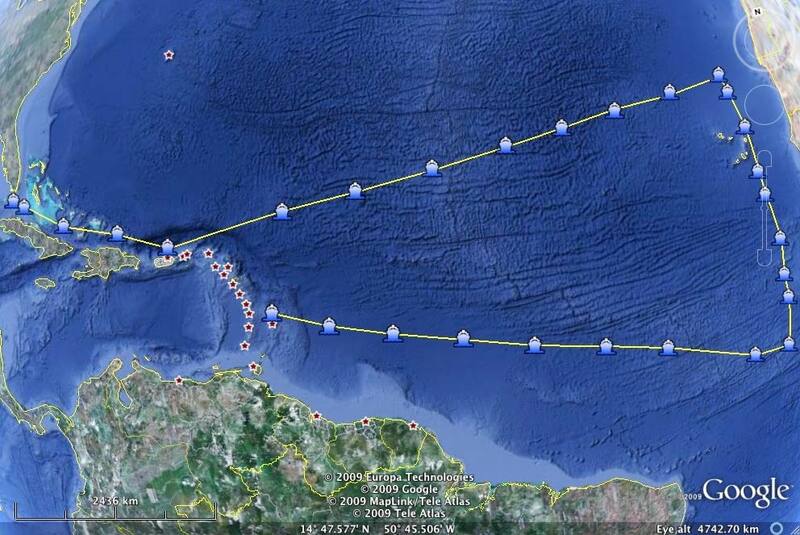 We have a break now from our 12-hour shifts and only have one more buoy to change out and only one more CTD to deploy. I wanted to write about a couple of things that I have noticed over the last couple weeks when sampling that I thought were noteworthy. The seawater we collect from 1500 feet down in the ocean, even though we are in the tropics, is still very cold. It is about 4 degrees C or 39 degrees F while the sea surface temperature is around 26 degrees C or 79 degrees F.
Another thing that is really cool is that when we are doing CTDs at night the lights from the ship attract squid and you can watch the squid chasing flying fish at the surface. The last thing that is strange, is that every once in a while even though we are hundreds of miles away from land, a butterfly or dragonfly darts around the ship. You just wonder where they have come from. Every night around 8 pm, there is meeting of all the scientists onboard. We usually get a weather briefing and then someone will give a seminar on the work they are doing. There are many links between the work that each scientist is doing on this ship and this is an important way to share ideas, get feedback and create new questions. There is down time on the ship and I wrote about the movies earlier. We have a ping-pong table set up in the main lab where we play in our spare time. Since we are so far from any land, safety is very important on the ship. We have fire drills and abandon ship drills weekly. After the drill there is a briefing and the safety officer discusses some of the safety equipment the ship has and its use. Today we went out to the fantail and the officers demonstrated how to use flares and smoke signals. I have continued to help out on the 11:30 am to 11:30 pm watch with CTDs and XBTs. Why do so many CTDs and XBTs? 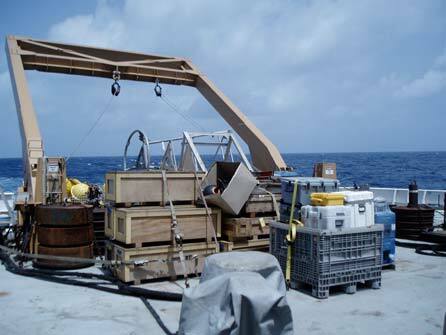 The scientists on board are developing a subsurface profile of the water temperature, salinity and density. Based on these data, models can be constructed and refined that can help us better understand what is happening in the Tropical Atlantic. The Brown arrived at the second buoy that needed to be serviced on July 24th. I was lucky enough to get on the small boat sent out to take some equipment off the buoy before it was pulled up on the boat. 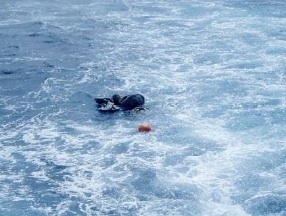 Once at the buoy, the radiometer and the anemometer were removed. An acoustic message is then sent from the Brown to release the anchor on the buoy. The buoy is then attached to a rope from the Brown and pulled up onto the fantail. 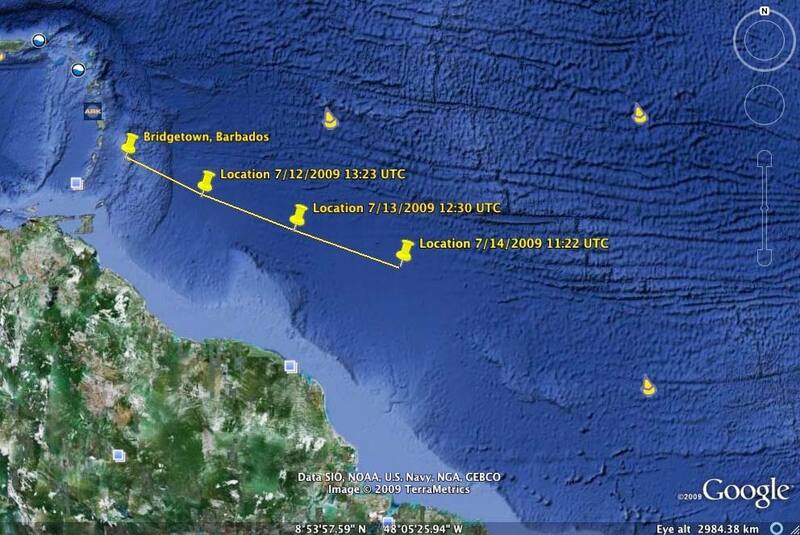 All the instrumentation and sensors below the buoy are pulled up on the Brown and exchanged. I attached a picture of the buoy to the right so you get an idea of all the instrumentation that is attached to these buoys. I could not believe all the fish that were around the buoy. Apparently, the buoy creates a small ecosystem, where all kinds of marine organism congregate. Algae and small crustaceans attach to the buoy and some of the cables that are underneath. Small fish eat the algae and crustaceans, larger fish eat the smaller fish and before you know it you have a food web. Some of the fish are huge. Yellow fin tuna, triggerfish and mahi mahi. This actually causes a big problem. Fishermen come out to these buoys and damage the buoy instrumentation when they are fishing and we end up losing valuable data. 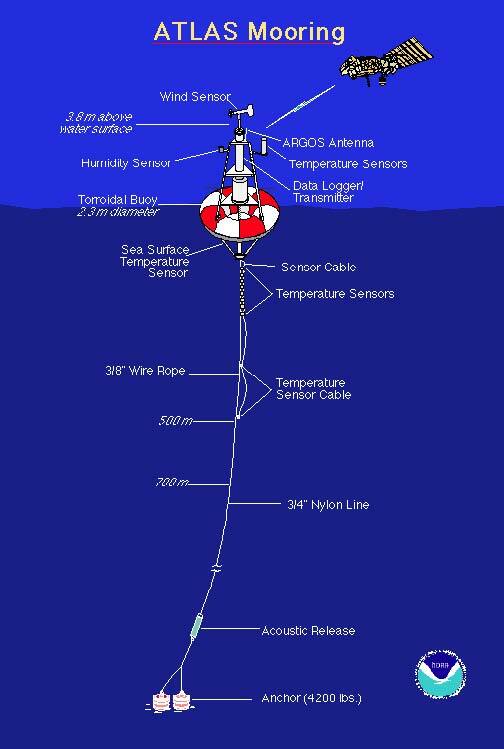 This figure shows all the instrumentation attached to the buoy. 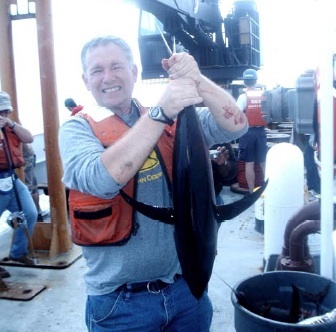 Once the buoy is pulled up onto the ship, the fish that were around it looked for a place to go. Sometimes they come under the ship. We threw a few fishing lines in after the buoy was pulled up on the fantail and the tuna were biting like crazy. We caught a few that afternoon and had them for lunch the next day!! Got one! It’s tuna for lunch! We arrived at the first buoy two days ago and exchanged the “package” which is kind of like the brains of the buoy. Four people went out with a small boat and exchanged the package. This is not an easy task since you have to climb off the small boat onto the buoy in what can be pretty rough seas and change instruments. We also deployed the “CTD” for the first time. 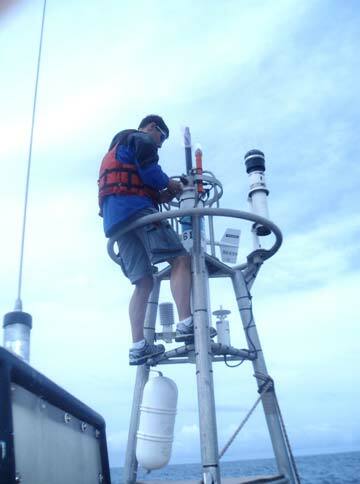 After the deployment, we collected seawater from various depths for salinity and dissolved oxygen analysis. 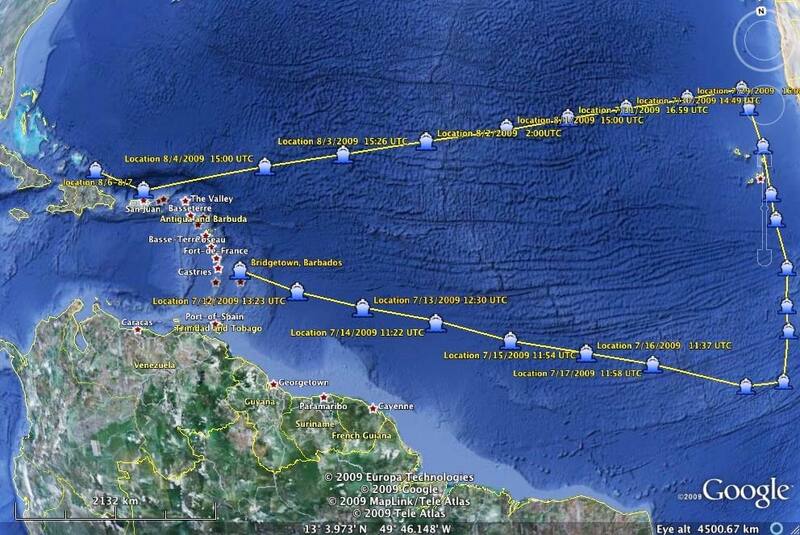 We also are deploying XBTs every 10 nautical miles on a 24 hours schedule as the ship steams along its course. There are two shifts. I am on the 12 noon to 12 midnight shift. The XBT (Expendable Bathythermograph) is dropped from a ship and measures the temperature as it falls through the water. Two very small wires transmit the temperature data to the ship. When it gets to about 1500 meters, the small wire is cut and the operation is over. 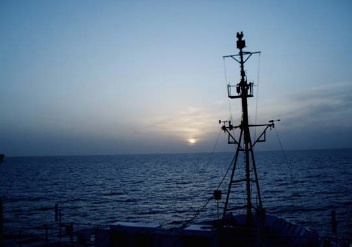 By plotting temperature as a function of depth, the scientists can get a picture of the temperature profile of the ocean at a particular place. Yesterday, we got to the second buoy and had to pretty much exchange it with a new package, sensors and an anchor. This took over 8 hours to do and takes a lot of manpower. 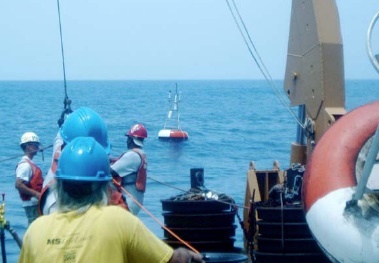 The buoy is actually pulled up on the deck as well as the instrumentation below the buoy and then new instruments, buoy and an anchor are deployed. If this is not done exactly right, everything can be destroyed. Wow, there is a lot of action right now on the ship. The atmospheric scientists are releasing sondes, collecting dust and smoke samples, and measuring incoming solar radiation at different wavelengths. There are people getting instrumentation ready for the next buoys we are steaming towards. People are deploying CTDs, XBTs, and drifters. Behinds the scenes the crew lends all kinds of support, from preparing food, working the winches and cranes, navigating through the ocean and working in the engine room It is really teamwork that makes this all work and not any one person could do all of this work. There are a lot of very dedicated people onboard this ship and all their hard work make this work!! We released our first radiosonde this morning. These balloons have instruments attached to them that will measure atmospheric pressure, temperature and relative humidity as they go up into the atmosphere. As the balloon rises, it expands as the atmospheric pressure outside the balloon decreases. After about 2 hours the balloon bursts and falls back into the ocean. Four of this particular type of radiosonde will be released every day. This data is used as input for weather prediction models, weather and climate change research, input for air pollution models and ground truth for satellite data. We also deployed our first global drifter this afternoon. 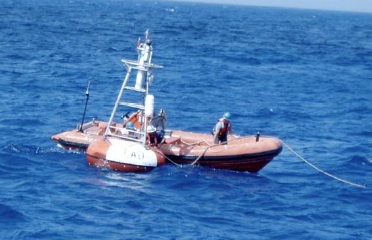 A surface drifter consists of a buoy and a sea anchor. 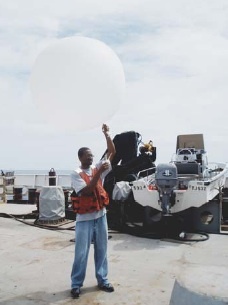 The drifters have sensors that can measure sea surface temperature and the ocean current. Information is collected by the sensors and uploaded to a passing satellite and then transmitted back to Earth where all the information from all the drifters give us a better picture of what is happening out in the ocean. 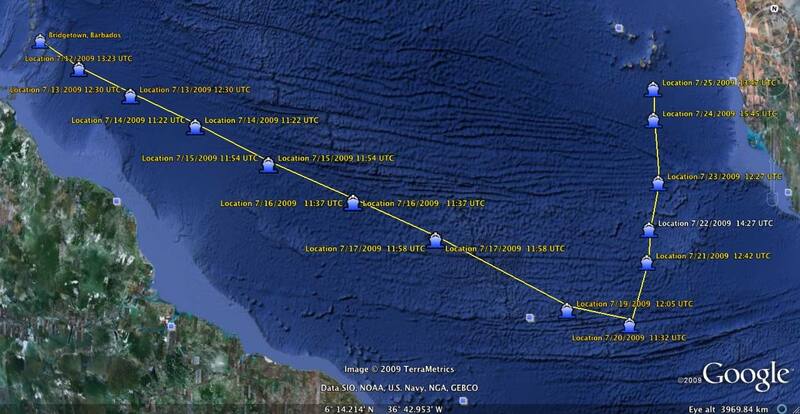 Drifters are deployed from hurricane hunter aircraft so we can better predict and understand hurricanes. 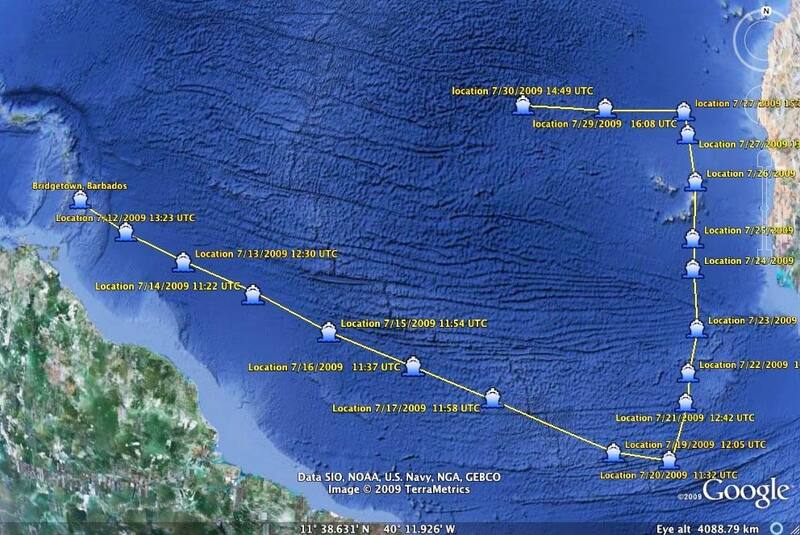 Data from drifters was used to determine where floating debris would be found shortly after the disappearance of Air France flight 447 on May 31, 2009. 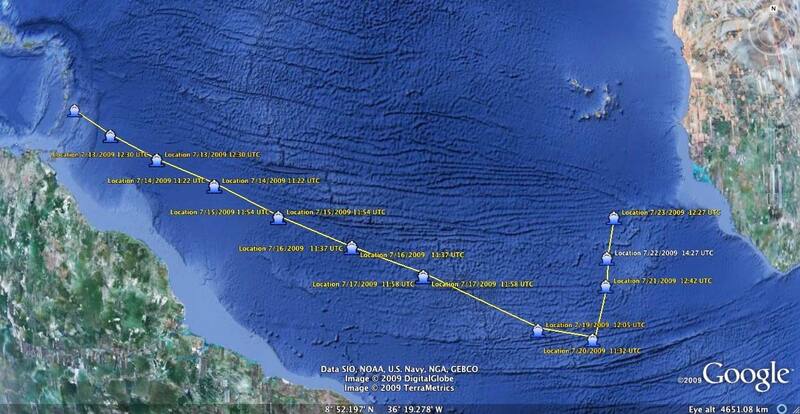 For more information on the NOAA Global Drifter Program, visit their website. The drifter buoy is deployed. 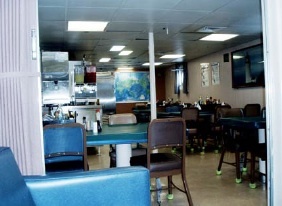 I have received a couple of emails asking about the food on the ship. We have three meals a day and there is quite a selection. For breakfast, you can have pancakes, eggs, sausage, oatmeal, fresh fruit or a selection of dry cereal. For lunch, it really varies; today there was a salad, hot dogs, hamburgers and french fries. Dinner also varies, but so far we have had fish, ribs, chicken and a salad. There is also a veggie option for each meal. Coffee, tea and other beverages as well as some snack items are pretty much available 24 hours.